Chillicothe again benefited from the short field in the 3rd quarter on a Dean Adkins touchdown and a Josh Kille 3 yard run to lead 28-0. All four drives started in Kirksville territory. Kirksville scored late in the 3rd in a 77 yard screen pass for their only score. 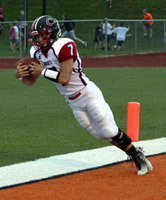 Unofficially, Chillicothe had 402 yards rushing led by Kille's 116 yards and Dean Adkins' 86 yards. Snyder completed 1 pass for 15 yards. Kirksville had 112 yards rushing and 109 yards passing including the 77 yard pass play.